All articles, photographs and other content of The Yomiuri Shimbun, The Japan News and Yomiuri Online are copyrighted works of The Yomiuri Shimbun (referring collectively to The Yomiuri Shimbun, Tokyo; The Yomiuri Shimbun, Osaka; and The Yomiuri Shimbun, Seibu) unless otherwise noted, and are protected by Japan’s copyright laws and international treaties. As a general rule, the articles, photographs, graphics and other elements may not be copied, reproduced, distributed, transmitted, displayed or published without the prior permission of The Yomiuri Shimbun. Articles, photographs and other content may be used by submitting proper request forms posted on this website and obtaining permission of The Yomiuri Shimbun, or in the case of third party materials, the owner of that content. A usage fee will be charged for the use of copyrighted materials unless otherwise noted. -When the purpose is strictly personal and the materials are copied by the user himself/herself for use at home. -When the purpose is educational and the materials are used for learning or for exams in primary, middle and high schools (including schools for the blind and children with disabilities). Yomiuri Shimbun content may not be used for libel against The Yomiuri Shimbun and relevant parties. The user must abide by the copyright laws of Japan. The user is required to expressly state the source of the content and its date of issue. For example: “Source: The Yomiuri Shimbun (date: Y/M/D)” or “Source: Yomiuri Online (Y/M/D)”. No part of any article, photograph or any other content may be altered. Quotes as permitted by the Copyright Law are limited to quotes and summaries that are objectively judged to be in line with the original intent of the content. If the content includes third party materials (such as articles by contributors to The Yomiuri Shimbun or those covering panel discussions, photographs provided to The Yomiuri Shimbun, illustrations and cartoons,?materials provided by news agencies, and advertisements), the user must obtain permission for their use from the proper owner(s). Any problems, such as infringement of privacy or other lawsuits, that may arise from use of third party material must dealt with by the user himself/herself and at his/her cost. The Yomiuri Shimbun reserves the right to demand indemnities if such problems incur damage. The Yomiuri Shimbun reserves the right to revoke permission for use of content if the terms and conditions are not observed, or the content is used for purposes other than what was declared in the submitted request form. The Yomiuri Shimbun reserves the right to demand indemnities in such cases. The use of content is limited to what was declared in the submitted request form. A new request must be submitted if the purpose of use is to change. The Yomiuri Shimbun reserves the right to change the terms and conditions without prior notice. The user will be bound by such changes. You may not download photos appearing on the Japan News website. If you want to reproduce Yomiuri Shimbun photos, refer to "Yomiuri Shashinkan (photo archive)" and "Photo News," both in Japanese. As for the terms and conditions for use of Yomiuri Shimbun photos, check with "Procedures to use Yomiuri Shimbun photos" in Japanese. 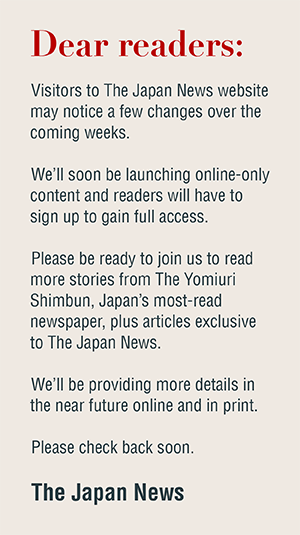 The linking and copyright policies of The Yomiuri Shimbun may be updated as required. Following such a change, the updated version applies. URLs on the Japan News website may be erased for one reason or another without notice being given on the linked Web sites. Associated Press text, photo, graphic, audio and/or video material shall not be published, broadcast, rewritten for broadcast or publication or redistributed directly or indirectly in any medium. Neither these AP materials nor any portion thereof may be stored in a computer except for personal and noncommercial use. Are Yomiuri Shimbun articles and photos protected by the Copyright Law? Yes. They are copyrighted materials subject to copyright protection. Are articles about traffic accidents or brief obituaries also copyrighted? Short articles cannot be deemed to be protected by the Copyright Law. But there are exceptions. Contact us when you are not certain about copyright law protection. Does the copyright of each Yomiuri Shimbun text or photo belong to the staff writer or photographer concerned? No. The Yomiuri Shimbun owns the copyright. Is the content of the Yomiuri Shimbun Web site subject to copyright protection? I want to copy The Japan News website articles or photos and download The Japan News website photos for reproduction on my own Web site. Do these acts constitute a copyright infringement? 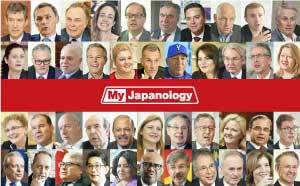 Can I link to any The Japan News website articles? Depending on linking methods, some links may infringe upon the rights of The Yomiuri Shimbun. Do you have any advice concerning copyright protection? Needless to say, it is important to recognize that copyrighted materials are intellectual properties and abide by the terms and conditions for use of them. Please follow these conditions regarding use of Yomiuri Shimbun photos. The Yomiuri Shimbun includes Yomiuri Shimbun, Tokyo; Yomiuri Shimbun, Osaka; and Yomiuri Shimbun, Seibu (Fukuoka). When using a Yomiuri Shimbun photo, clearly state that the photo has been provided by The Yomiuri Shimbun. Do not alter the photo or use only part of the photo. Do not alter factual elements of the photo caption. When summarizing the caption from the original, retain the caption's original meaning. Do not lend the photo to any third parties. Give due consideration to copyrights, rights of portrait and protection of privacy when using the photo. Any dispute arising from carrying a photo must be settled at the user's expense-- The Yomiuri Shimbun will not liable or responsible for settling any such dispute. A photo may be used only once. Please return the photo (or photo data contained in a floppy disk, MO or e-mail) to The Yomiuri Shimbun immediately after use or discard it. Do not use the photo for any purpose other than that given in the application. To use one photo in two or more publications or in other media, submit a separate application for each usage. Do not use the photo in electronic media, such as on a Web site. Such usage will only be permitted after special prior arrangement. Please send a copy of any publication or media carrying a photo provided by The Yomiuri Shimbun to The Yomiuri Shimbun Photo Center. Do not copy, sell, or give a photo to any third party. State in the application if you wish to use the photo in an autobiography or other publication. A photo may be used only once. Please return the photo (or photo data contained in a floppy disk, MO or e-mail) to The Yomiuri Shimbun immediately after use or discard it. Do not use the photo for purposes other than that given in the application. If a Yomiuri Shimbun photo is used in a medium that can be viewed by a third party, send a copy of the publication or other medium that the photo appeared in to The Yomiuri Shimbun News Photo Center.